There is no problem with this requirement, providing the exact lie and location of the ball that was moved is known. However, very often this is not the case, as in the scenario where a player is 100 yards away from where their ball has come to rest in the rough and they witness someone from another group playing it by mistake. In most cases it is not possible for the player to be sure of the lie of their ball in the rough, or precisely where it was at rest. If the player does know the spot, but the lie has been altered (e.g. 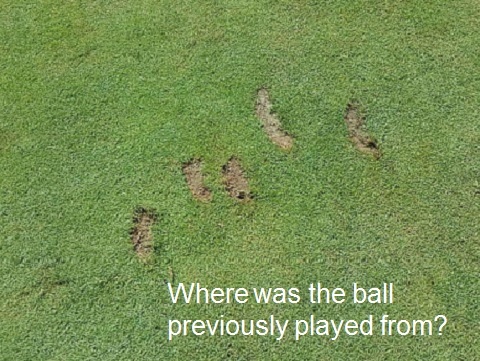 a divot hole has been made by the other player when making their stroke), Rule 20-3b is relevant and the ball must be placed in the nearest lie most similar to the original lie (check the wording of this Rule for the full detail). If it is impossible to determine the exact spot where the ball is to be replaced, Rule 20-3c requires that the ball must be dropped as near as possible to the place where it lay (again check the wording of this Rule for the full detail). This subject leads to another possible area of confusion, the difference in the Rules of Golf between placing and replacing. 1) Putting the original ball on a new spot (e.g. when the original lie has been altered, Rule 20-3b, as above, or when ‘Preferred Lies’ applies). 2) Putting a substituted ball on a new spot (e.g. Rule 20-3b when the original ball has been lost). 3) Putting a substituted ball on the original spot (e.g. Rule 18-1, when the ball at rest was moved by an outside agency and has been lost). 1) Putting the original ball back on the original spot (e.g. on the putting green, or when it has been lifted because it interfered with another player’s stroke). 2) Dropping the ball (or a ball), required to be replaced, as near as possible to an estimated spot not precisely known (e.g. Rule 20-3c, as above). At last! I am pleased to confirm that my new eBook is available online. Please click on this link to check out ‘999 More Questions on the Rules of Golf’. Don’t hesitate to click on this link because you already have purchased my first Book, or one or more of my eDocuments. This is an entirely new publication, in an innovative format that I think will be of interest to anyone who wants to improve their understanding and knowledge of the Rules. There are nine questions, answers and most importantly, references, on 111 different golfing scenarios, most of which will be familiar to regular golfers. In addition, there are over 200 photos and diagrams, which help to clarify the content and make it easier to follow. Once again, here is the link to my ‘999 More Questions on the Rules of Golf’. For those of you that prefer a paperback version, both of my ‘999 Questions’ books are available in a paperback format from Amazon/CreateSpace. Paperbacks do cost more. However, be warned that I have been unable to get them to remove the out of date publications, so if you do purchase paperbacks from this source be extremely carefully that you choose the most recent versions, which include the amendments to the Rules at January 2016. Also, please remember that if you purchase the Kindle version from Amazon you will only receive the .mobi format, whereas buying from me at this link results in you receiving a.pdf file at no additional charge. If a player is unsure where their ball lay, and is required to drop, do they incur the typical penalty stroke for that drop, or is it deemed a "free" drop? That obviously depends on the circumstances of why they are dropping where they last played from. If they could not find their original ball then they do incur the penalty of stroke and distance, Rule 27-1. If someone else has played their ball by mistake then they are dropping their ball without penalty. To know golf right is to know its terminologies right as well. Always had a difficulty grasping the concept of replacing and placing, very easily explained. Thanks Barry! Golf Myth ref: you can't lean against a flag stick removed from hole whilst putting. You may lean the flagstick against yourself, but you may not lean on a flagstick to help you balance, as that would be a breach of Rule 14-3, use of abnormal equipment to assist in making a stroke.